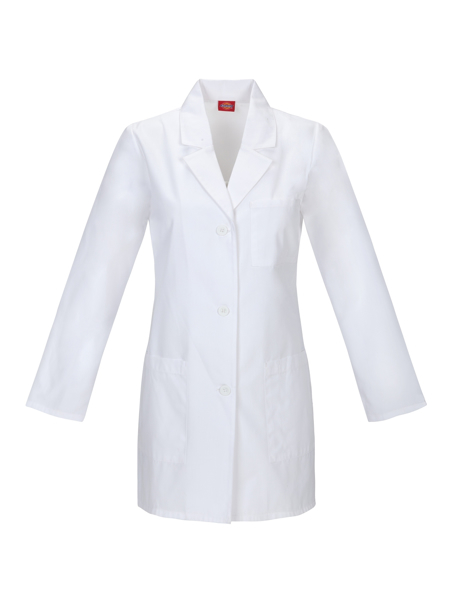 A button front lab coat that features a notched collar, a chest pocket and two patch pockets (left pocket has a pen and instrument slot). Back princess seams and a back belt with adjustable buttons lend a slender look. Center back length: 32". 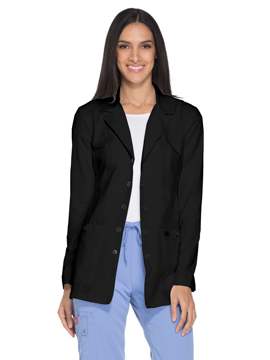 Contemporary fit, notched collar lab coat features front and back princess seams, patch pockets with button tab detail and back belt tabs. Center back length: 28". One-piece, lined collar with notched lapel. Non-yellowing UV buttons for long-lasting whiteness through industrial laundry processing. Left chest pocket with pencil stall and two lower pockets. Princess seams on front and back. Side vent openings. Center back length: 38¼". 2-pocket fitted lab coat with front pocket, back belt tab button details and back vent. Center back length: 32". Sleeve length: 23¼" - 25".